The biggest art heist in history, a Monet destroyed in a fire at one of the world’s top museums and an unflattering portrait of a prime minister used as kindling for a midnight bonfire are three of the stories presented in Mystery of the Lost Paintings, a television series that documents the creation of digital facsimiles of seven masterpieces lost during the 20th century because of fire, war or theft. The project is a collaboration between the television channel Sky Arts, the independent Italian production company Ballandi Arts and the Madrid-based digital production company Factum Arte. “We’re taking viewers deep into the creative process and uncovering how the greats might have worked,” says the UK director of Sky Arts, Philip Edgar-Jones. “The philosophical question around these facsimiles remains difficult to answer: can we—and should we—reproduce a great work of art? I’m hoping our series will be an important addition to this debate.” But for Adam Lowe, the founder of Factum Arte, this is not an exercise in making fakes “but one in understanding what an object was”. He adds: “I don’t think anything negative can come from deep understanding; I think it comes from shallow thinking.” The seven-part series is due to be shown weekly in the UK on Sky Arts from 2 May. 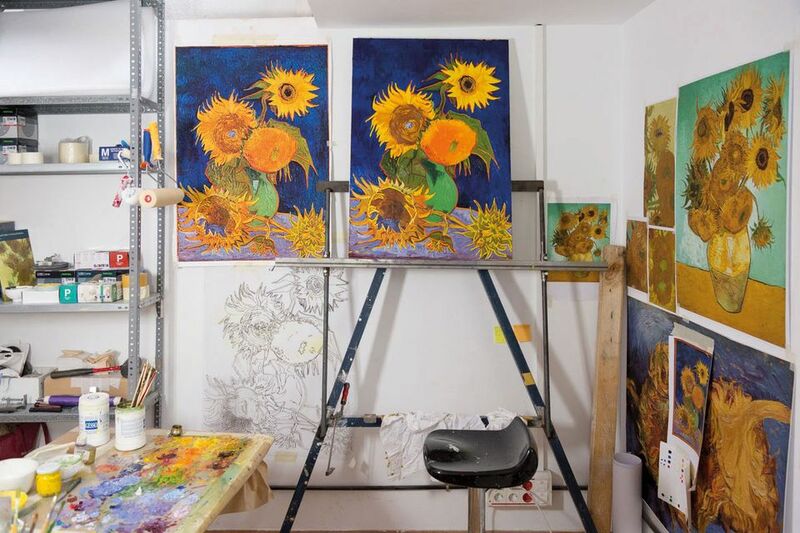 Van Gogh’s Six Sunflowers was hanging in the Japanese collector Koyata Yamamoto’s home, near Osaka, when it was destroyed by a US air raid in 1945. The team used a 1920s colour photograph of the work to guide the creation of the facsimile. The newly discovered colour photo was found by The Art Newspaper’s correspondent and Van Gogh scholar Martin Bailey, who included it in his 2013 book The Sunflowers Are Mine. Over the course of one week in 1888, Van Gogh painted Six Sunflowers as well as three other sunflower pictures, including one in the National Gallery in London. The UK museum scanned its painting and Factum Arte copied the brushstrokes in that work to create the “new” Van Gogh. “I think the colour and physical presence of it is very close to the original,” Adam Lowe says. This sensual depiction of the Polish-born artist Tamara de Lempicka and her lover Ira Perrot, painted in Paris in the roaring 1920s, was last seen in the Parisian home of the pharmaceutical titan Pierre Boucard in 1940, when the Nazis requisitioned the property. The only available photograph of the painting is in black and white, so the team worked with experts to choose appropriate colours as well as to estimate the original dimensions of the piece. Factum Arte only had one “not very good” colour reproduction to aid its recreation of Vermeer’s The Concert, which was stolen from the Isabella Stewart Gardner Museum in Boston in 1990 in what has been called the biggest art heist in history. 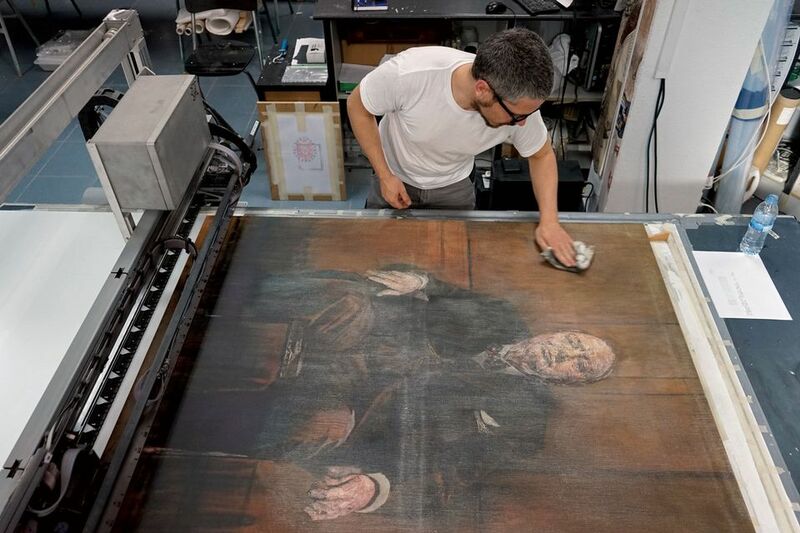 “The painting had undergone a bad restoration and that was all you could see in the colour print,” Lowe says. 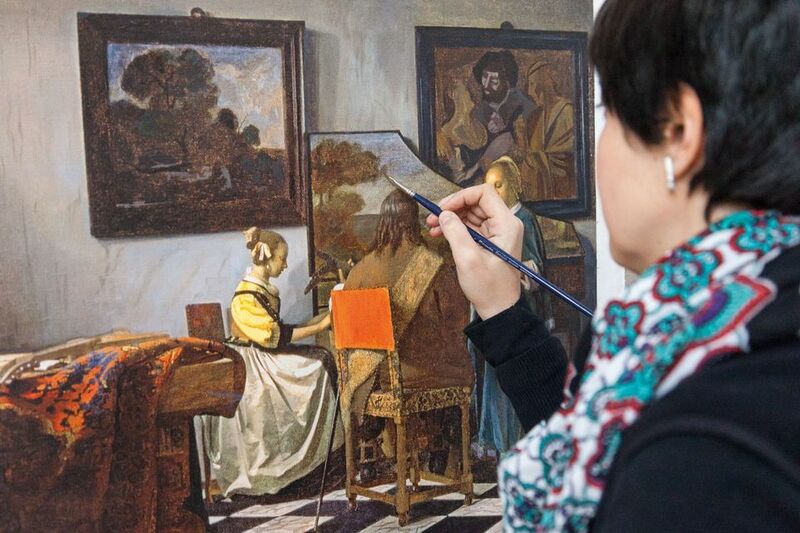 Experts on the Dutch artist were consulted before two artists were asked to “paint like Vermeer” and create two separate versions of the picture. These versions were photographed, merged and overlaid over the old photograph before being digitally retouched. For Lowe, the breakthrough came when they were able to scan a similar composition by Vermeer in the UK Royal Collection to obtain the correct surface texture. 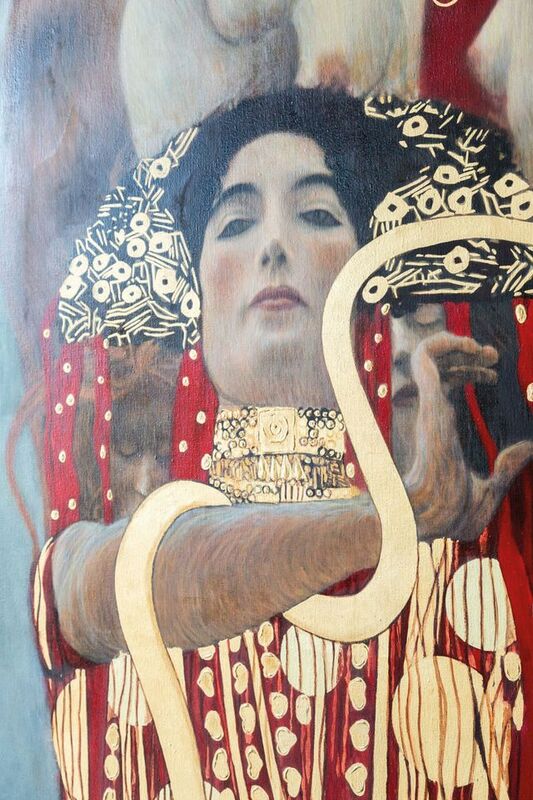 In 1894, Klimt was commissioned to create a series of allegorical paintings for the University of Vienna. When officials saw this monumental painting of Hygeia—the Greek goddess of health—surrounded by a skeleton and a sea of nudes, they labelled it pornographic and a misrepresentation of the state of the medical sciences in Vienna. A collector bought the painting instead. During the Second World War it was moved 60km north of the Austrian capital to the Schloss Immendorf. It is believed to have been among the works destroyed when the Nazis, who had taken over the castle, bombed it as they made their retreat in May 1945. The team only had a black-and-white photograph of the entire work, a colour photo detail of the piece and two sketches to guide their reconstruction. 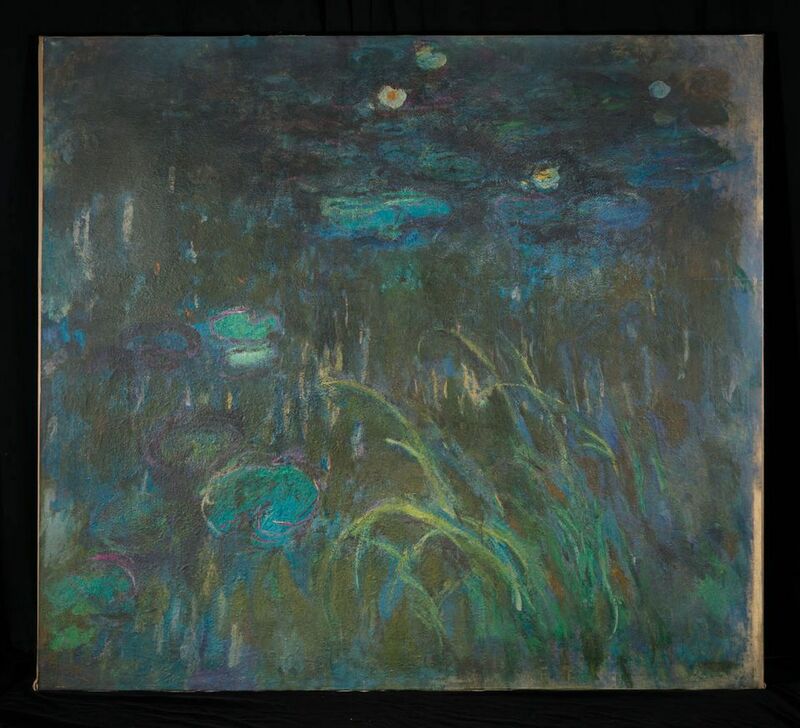 Lowe says there were two game-changing moments in the recreation of this painting by Monet, which was destroyed in a deadly fire at the Museum of Modern Art in New York in 1958. The first was when the team found out that the original, damaged canvas was kept as a case study in the conservation department of New York University. The second was a visit to Tate Modern in London, where they studied the surface of Monet’s paintings and noticed that Monet liberally applied his paint. They had assumed that the bubbles and marks revealed during the scanning of the surface of the damaged work were a result of the fire. When Winston Churchill spoke at the official unveiling of his portrait painted by the British artist Graham Sutherland, the prime minister offered a withering assessment of the work. With a sly smile, he said: “It’s a remarkable example of Modern art.” Obviously unhappy with the aged face that stared back at him, that was the last time the painting was exhibited. Within days, it disappeared. Decades later, historians learned that Churchill’s wife, Clementine, had it burned in the dead of night. The team tracked down one of the few known photographs of the painting, which they discovered was taken by the noted war photographer Larry Burrows, as well as Churchill’s Savile Row tailor, to glean details about the suit the statesman was wearing in the portrait. This photograph, along with Sutherland’s preliminary sketches in London’s National Portrait Gallery, were instrumental in recreating the work. 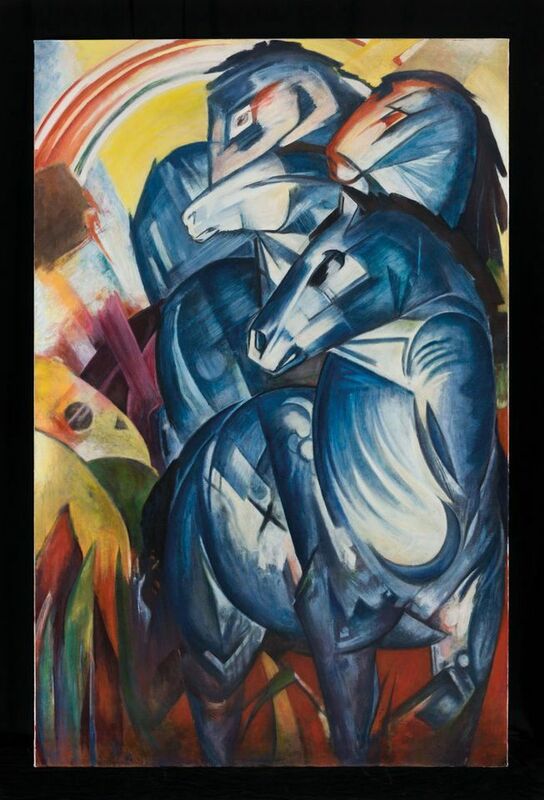 For Lowe, the eureka moment in the reconstruction of The Tower of Blue Horses came during a visit to the Lenbachhaus and Pinakothek der Moderne museums in Munich to see other works by the German Expressionist. He realised the colours were too bright in their earlier attempts so they toned them down. “We moved away from a cliché of Franz Marc into something more realistic,” he says. Scholars have suggested that Marc was representing the Four Horses of the Apocalypse in a premonition of the outbreak of the First World War. He was conscripted to the German army and was killed in battle in 1916. The painting, which was acquired by the Nationalgalerie in Berlin, was exhibited in the Degenerate Art exhibition in 1937. It went missing at the end of the Second World War.